Where a single critical failure can bring production to a halt reliability is priceless. Bearings in a steel mill, compressors in a chemical plant, pumps in a refinery, cranes on an oil platform – each a critical cog in a well-oiled machine. A single failure can bring production to a halt at a daily cost of millions. Use industrial oil analysis to monitor the entire facility, get obsessive about your critical systems and make sure those failures are caught before they can halt the entire operation. While you are at it, make your maintenance activities count and save by extending component life and reducing unnecessary oil changes. Our easy to use software will help you trend the results. Our advanced tests will interrogate every wear particle. Our patch tests will help you see what’s in your hydraulic systems. Our emergency response will give you answers within hours, keeping you and your plant at your most productive. This suite comprises all of the tests present in Package A and adds the determination of the oil’s cleanliness as described by the ISO Cleanliness Code. This package is the routine suite for hydraulic and turbine oils, as well as for any systems where high cleanliness levels are required. It adds a lot of detail about the types of wear particles and contaminants in the oil. Together with PQ Index and Elemental Analysis it delivers a comprehensive overview of the wear situation. 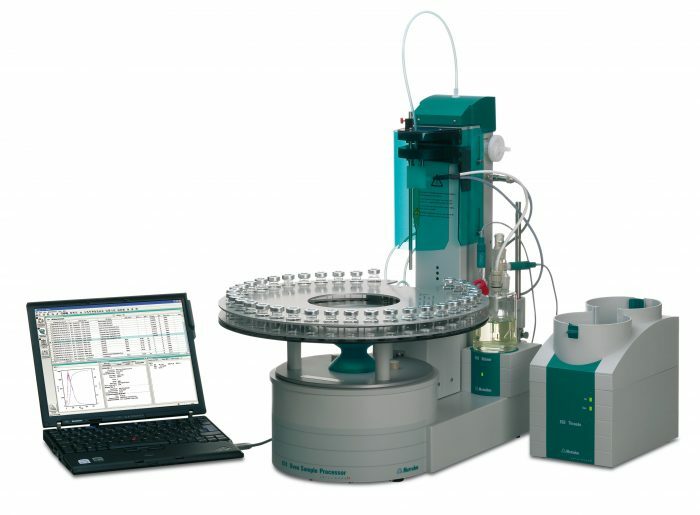 Analytical Ferrography is a technique for depositing and analysing wear particles contained in an oil or grease sample. If a failure has occurred we can help identify the cause and prevent re-occurrence. 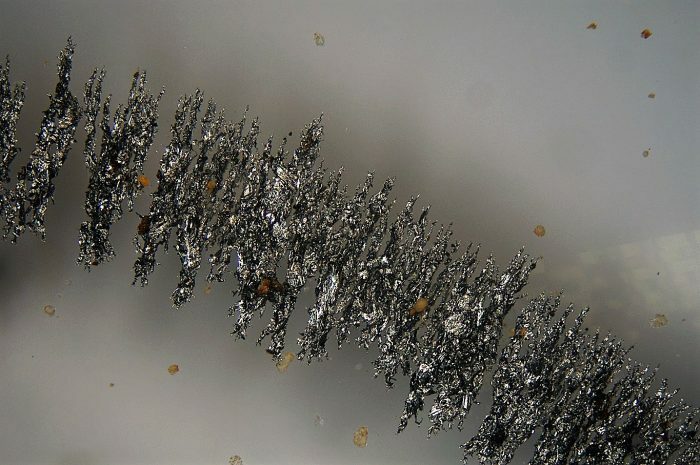 Analytical Ferrography is a technique for depositing and analysing wear particles contained in an oil or grease sample. The sample is deposited onto a glass slide, with the particles trapped by strong magnets and the oil washed away with a suitable solvent. Both linear and rotary particle deposition systems exist. At STS preference is given to a rotary system, which has been developed at the company. It ensures good separation of particles over the three rings, with particles also being sorted by size with the larger particles settling out on the inner ring. Once deposited the particles are analysed by a metallurgist, who is able to report on the relative quantities, types and sizes of particles present. A Particle Quantifier Index of the slide is also recorded. All of this is taken into account to produce a comprehensive report on the wear rate and situation. You can find an example Ferrography Report here. Depending on the failure mode (e.g. wear related or catastrophic failure due to overloading), there may be wear metal evidence present in the lubricant or in the oil filters. 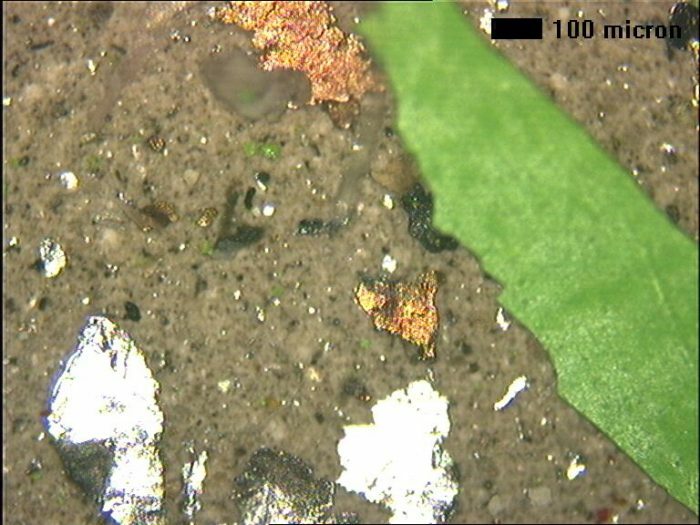 We are able to extract and analyse this wear debris through a collection of different analytical techniques. 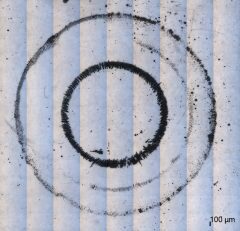 Extracted particles can be deposited on a filter membrane during the Patch Test or deposited on a glass slide to enable Analytical Ferrography. Elemental data can be obtained from bulk fluid analysis as well as from Scanning Electron Microscopy. The latter allows for individual particles to be interrogated and for data to be compared against machine metallurgy. Oil filters are essential to maintaining oil cleanliness and removing wear metals and contaminants. As they perform their function, however, they also remove some of the information about wear and contamination levels from the oil stream. This is then stored in the filter itself. Fortunately Filter Debris Analysis grants us access to this store of information. By extracting and analysing the entrained particles we can learn a lot about the wear situation or the source of contamination. Oil filters come in many shapes and sizes and how we treat an individual filter will depend on its size and construction. 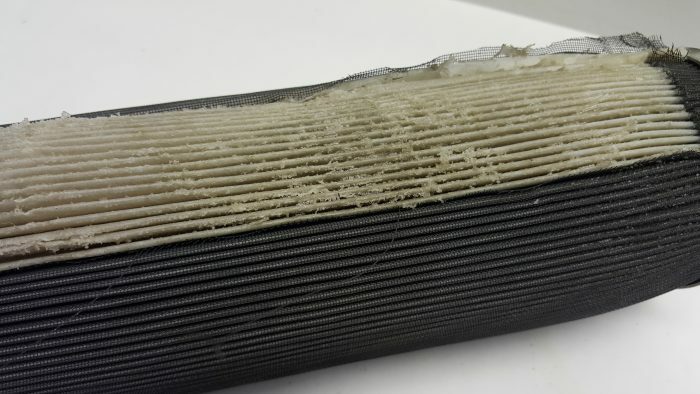 Typically a section of the outer cage is cut out and removed to enable access to the filter media. A section of the filter media is then removed and placed into a beaker. The beaker is then filled with solvent and an ultrasonic bath is used to agitate and extract the particles and any residual oil present. The solvent is then evaporated leaving the particulates and any residual oil. 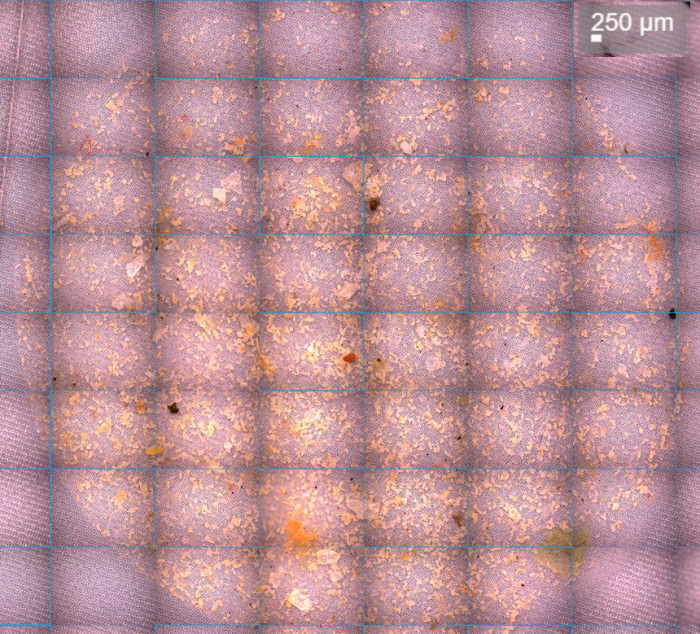 A portion of the debris is then deposited onto a filter membrane for microscopic analysis. The remaining oil/debris mixture is then analysed using a Rotating Disc Electrode Optical Emission Spectrometer to determine the elemental composition of the debris mixture. This gives a breakdown of the different wear metals and contaminants present. Where more detail is needed, the membranes containing the particles are analysed using a Scanning Electron Microscope with Energy Dispersive X-Ray facility. This provides information on the exact elemental composition of individual particles, which can then be matched to specific component metallurgies. In addition to wear debris analysis we are able to review failed components and engage a select group of partners to deliver a comprehensive analysis. 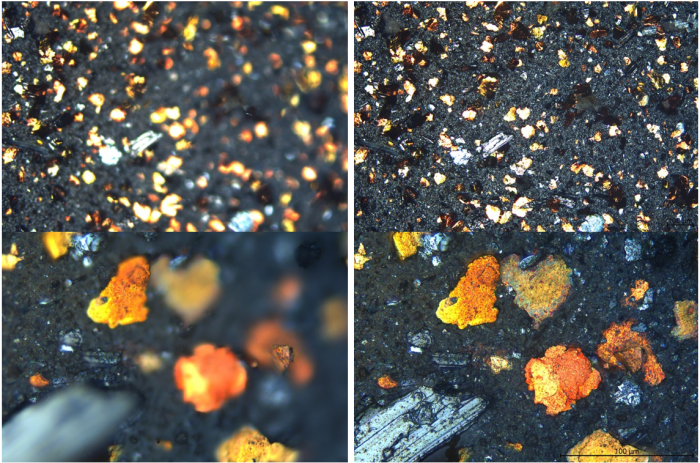 Techniques available include the initial visual inspection, sectioning and metallographic analysis, hardness testing, elemental analysis via SEM-EDX, etc. Varnish is the sticky residue created by the decay of both mineral and synthetic lubricants. Although it can cause a variety of problems there are solutions for monitoring and controlling oil degradation and varnish formation. Varnish is the sticky residue created by the decay of both mineral and synthetic lubricants. If left unchecked it can bring the entire operation to its knees. 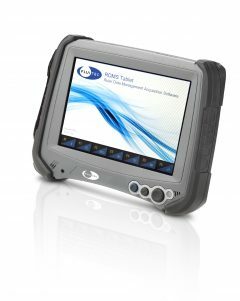 It can cause premature failure, erratic operation and can be the cause of a costly shut down. There are many signs of varnish build-up, including sticky valves, overheating bearings, decreased effectiveness of heat-exchangers, blocked filters and reduced lubricant life. A way of detecting build-up of varnish and its precursors early is through Membrane Patch Colorimetry. The test is a reflection of both the solubility of the oil and the amount of varnish precursors in the lubricant. Different types of lubricant (e.g. Group I and Group II) have different solubility properties and are able to mobilise degradation products to a different degree. This means that some oils degrade more rapidly but are better able to maintain degradation products in solution preventing varnish build up. Others have better oxidation stability but at the cost of poor solubility - even relatively small quantities of varnish precursors may result in varnish deposits. Things get even trickier when a Group I lubricant is replaced with a Group II oil! This also means that a simple oil change is rarely sufficient to eradicate varnish problems. It doesn't help that varnish does not deposit uniformly throughout the system. Regions with high local pressures are at risk as are the low flow areas, especially if the oil has cooled after passing through some exposed pipework or after a shutdown. This temperature sensitivity means that seasonal variations and interrupted operation make diagnosing varnish even trickier. Whatever your situation, monitoring varnish potential through Membrane Patch Colorimetry will help you stay in control. 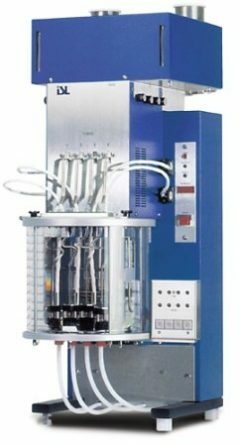 As the solubility of a lubricant varies with both temperature and time, the test procedure includes a heat and rest cycle. 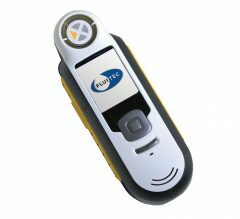 This is used to standardise each measurement and ensure consistent comparisons can be made with every sample. After the heat and rest cycle the lubricant is mixed with a solvent and filtered through a fine membrane filter. The shading of the membrane patch is then measured with a colorimeter to determine the varnish potential value. If the measured MPC/VP value is high, varnish mitigation technologies can be employed to clean up the system. Varnish precursors are very fine sub-micron agglomerations of oxidation products and can pass through conventional filters, although when the oil is saturated they can cause filter blockages. Therefore special filtration technologies aimed at removing the fine sub-micron contaminants need to be utilised. Such technologies include electrostatic filtration, depth media filters and the electro-physical separation process to name but a few. Each comes with its own strengths and weaknesses and should be considered carefully depending on specific application. A key property of the oil is its oxidation stability – that is, its ability to resist oxidation. A standard measure of this property is the Rotating Pressure Vessel Oxidation Test (RPVOT, formerly RBOT, ASTM D 2272). 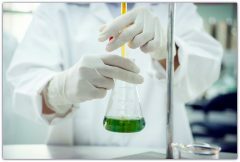 The test presents a simulated worst case scenario, where an oil sample is subjected to the harsh conditions of high temperature and high pressure oxygen atmosphere in the presence of water and a copper catalyst. As oil oxidises oxygen is consumed and the pressure drops. Time taken to achieve a specific drop in pressure is then recorded. By monitoring the RPVOT value of a lubricant its remaining useful life can be assessed. Note however, that while this test was very useful for assessing Group I oils, which age in a fairly predictable manner, with Group II oils things get a little trickier. Many of the modern synthetic lubricants achieve more than 1000 minutes in the RPVOT test. However, for some oils this is the result of the additives inhibiting the copper catalyst. As a result, the RPVOT value measured will stay very high until the additives have depleted, at which point it may reduce rapidly. It is therefore prudent to augment the RPVOT test by also monitoring levels of the anti-oxidant additives. For that we can rely on the RULER test. 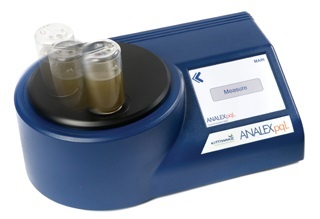 Remaining Useful Life Estimation Routine (RULER) uses Linear Sweep Voltammetry to measure the levels of Amine and Phenol anti-oxidant additives in the oil. These are typically compared with a baseline measurement obtained from a virgin oil sample (ideally from the same batch of oil). If anti-oxidants are allowed to deplete below a critical level the oxidation process accelerates, leading to reduced oil life and potential for varnish deposition. RULER monitoring enables management of the additive levels through top up or partial changes, significantly extending the life of the oil.